Ndenzeni - What have I done? What is life like for a twelve-year old boy born HIV+ who loses his family members one by one, is stigmatised by his community and drops out of school? “Ndenzeni - What have I done?” is a digital story about a boy left to fend for himself in a Cape Town township, told through the eyes of his neighbour Cebisa Fubesi. As a participant of a Digital Storytelling workshop, Cebisa asked to tell her own story about her neighbour: in it she powerfully conveys the prevalence of discrimination alongside a lack of support and comfort available to children orphaned due to HIV/AIDS. The 18th Praxis International Commune On Participatory Development: The Workshop 2014, Bengaluru, India, 8-15 September 2014. The commune is an annual residential workshop that brings together development workers, policy makers and proactive individuals from across the world to share information and experiences as well as keep themselves abreast of the latest in the field of participatory development. It provides a theoretical understanding of participatory methods and the opportunity to apply them in the field. The modules on offer this year include: Advocacy, Campaign & Networking, Community Mobilisation,Corporate Social Responsibility and Community Development,Participatory Communication, Participatory Creation Of Urban Safe Spaces For Children,Participatory Methods and Approaches,Participatory Planning,Monitoring & Evaluation: Focus On Sustainability, Public Accountability. Come and curl up with a living book! As change accelerates, development professionals find themselves more than ever explorers of an unknown and unknowable future. This brings opportunities, excitement and surprises, and demands continuous critical reflection and learning. 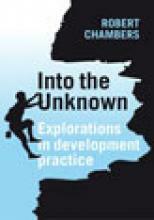 In the opening part of this book, Robert Chambers reviews his own life, including his early career, participation in the World Bank’s Voice of the Poor project and research and engagement in South Asia on canal irrigation. These experiences led him to examine personal biases and predispositions, and to recognize the pervasive significance of power in forming and framing knowledge. July 21-26, 2014. University of Ottawa, Canada. Monitoring and Evaluation is a vital management tool. Communities, organizations and funders need to know how effective their efforts have been. But, a key question being asked is "Who should make these judgments, and on what basis?". Too often, it is outside "experts" who are completing the report card primarily to fulfill an accountability function for the funding organization. Participatory monitoring and evaluation (PM&E) is a different approach involving a wide range of stakeholders deciding together about how to measure results and what actions should follow. This six-day workshop is set in the community to maximize learning, group interaction and networking. Initiatives of Change in partnership with the Child to Child Trust and Universal Education Foundation present the second edition of CATS: Children as Actors for Transforming Society. This conference provides a space where children, young people and adults live, learn and work together as equal partners in transforming society. Over six days, the beautiful venue of Caux Palace (Switzerland) will become a meeting point for a global community of advocates for the rights and well-being of children. 30%: Women and politics in Sierra Leone’, a short film produced by Pathways to Women's Empowerment has been recommended as a staff choice by Vimeo, resulting in 1000 views an hour. The documentary follows the challenges and successes of gender equity in politics in Sierra Leone. The women's movement in Sierra Leone is becoming increasingly influential, and the film tells the story of three women who are fighting for their role in government as the women’s movement campaigns for a 30% quota for women in government.